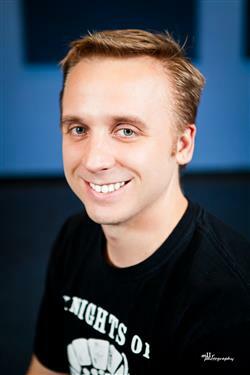 Matt Ehlers is Assistant Director of Bands/Percussion Director at McCallum High School Fine Arts Academy in Austin, Texas. Originally from Seward, Nebraska, he received his Bachelor of Music in Music Education degree from the University of North Texas. As Assistant Director of Bands, Ehlers conducts the Symphonic Band, Beginner, Intermediate, and Advanced Steel Band classes, high school percussion ensembles, and co-directs the JV Full Orchestra. In 2013, with the help of a Creative Classroom grant, Matt founded the thirty piece Samba Knights at McCallum High School and created a community partnership with the Austin Samba School under the direction of Robert Patterson. Ensembles under Ehlers have earned Superior ratings at the University Interscholastic League Concert (U.I.L.) and Sight Reading Contest in addition to Superior ratings at the U.I.L. Solo and Ensemble Contest. The Advanced Steel Band also had the honor of performing at the 2006 Percussive Arts Society International Convention, 2007 Midwest Band and Orchestra Clinic, the 2012 P.A.S.I.C. as part of the Andy Narell Steel Band/Big Band project, and the 2012 Midwest Band and Orchestra Clinic. McCallum’s percussion ensemble was selected as a winner of the 2015 Percussive Arts Society International High School Percussion Ensemble Contest and a winner of the 2015 Black Swamp Percussion Ensemble Showcase. Ehlers was awarded McCallum High School’s “Teacher of the Year” for the 2010-2011 school year. In 2006, Ehlers founded the annual “Knight of Percussion Benefit Concert” with the intent to raise money and awareness for a different local charity each year through a percussion concert performed by McCallum High School and Lamar Middle School percussion sections. Currently, Matt serves as board President of the Small Victories Foundation, a nonprofit organization that empowers individuals recovering from traumatic brain injuries through participation in the arts. During the summertime, Matt co-directs two annual youth steel band camps in Austin. Ehlers is also an active marching percussion arranger and steel drum composer with works published by Boxfish Music and Drop6 Media. He is also a proud “Percussion Educator” artist for Innovative Percussion.